Adjacent to the Village Core, next to the Peaks Hotel with gorgeous views of Palmyra Peak, this 2,300 sf free-standing home offers three bedrooms, sleeping loft, two dens each with a comfort sleeper king or queen bed. Three full baths, high-speed secure wi-fi, cable TV, steam shower, fully-equipped kitchen, private hot tub and TWO SKI MEDALLIONS which provides full mountain skiing for two guests per day. All bedrooms have private baths with heated floors and spa products.. Sleeps 12. Separate laundry room with two washing machines and 2 dryers, folding table, drying racks and storage. Complimentary ski and boot storage with ski-in, ski-out access at the Peaks Hotel. You can ship your luggage and ski equipment in advance and we'll arrange to have it delivered to your home on your day of arrival. We provide a dining guide and maps, make dinner reservations for you and get you acquainted with Telluride and Mountain Village. With keyless entries, you can arrive any time. In the morning, walk a few steps to the valet, grab your pre-warmed ski boots, step into your skis and you're off! Never have to carry your skis from arrival until you depart. The Peak's valet offers FREE hot chocolate and hot cider all day will tune your skis overnight (for a small fee) so they are ready for you, sharpened and waxed in the morning. Ski Butlers will arrange to delivery and pick up your rental skis as a part of our service and you get a 20% discount through us. This also gives you an opportunity to demo this seasons newest ski and boarding equipment. After you're done skiing, leave your skis, change into your walking boots and you're just steps from your home. You never have to walk in your ski boots or lug your skis. Bedroom #3 - Queen bedroom with private bath with spa products, TV, loft with two, twin beds. Den #1 - King size comfort sleeper with flat screen TV, desk with ethernet and high speed wi-fi. Den #2 - Queen size comfort sleeper with 37' flat screen and DVD. Large, Hi-Def TV in the living room plus a sofa sleeper. Our telephone number will be provided once you book. You may use it to contact us anytime, including evenings and weekends. We want your stay to be welcoming and we're here 24/7 to assist you. No car is necessary for two reasons. #1 - you're right in the core so it's ski-in and ski-out. #2 the FREE gondola takes you into Telluride from 7:00 am until midnight, every day. This home is NOT next to the Parking Lot Gondola. This important difference means you never have to wait in line or call dial-a-ride to get to the lifts or to the core. Don't be fooled by the many condos that advertise themselves as 'right next to the parking lot gondola'. Those can be inconvenient because that gondola station has a line every morning and every afternoon that can be as long as 40 mins to get to the lift ticket office, ski school or just to go into the charming town of Telluride at night! One reserved parking space and additional, non-reserved parking is available. Keywords: Ski-in, ski-out, private ski valet. Laundry room, dens, 3 bathrooms, fireplace, large dining table seats 10. We own a jewelry store and art gallery on Main Street in Telluride and also the Alpinist & the Goat Fondue restaurant in town. We love it here! Please stop by when you're in town and say 'hello'. We'd love to show you our town. Business License #1661. The 'Crystal' are the only free standing homes in the village core with ski-in, ski-out access. Our large, high efficiency boiler means you never run out of hot water, even after 14 showers. We even have a hot water refill spigot at the hot tub so that you can refill with hot water instead of waiting for the hot tub to get up to tempurature. Only a few steps to the Peaks' ski run and your private, ski-valet, spa and Fitness Center. Apres ski with huge views and live music. 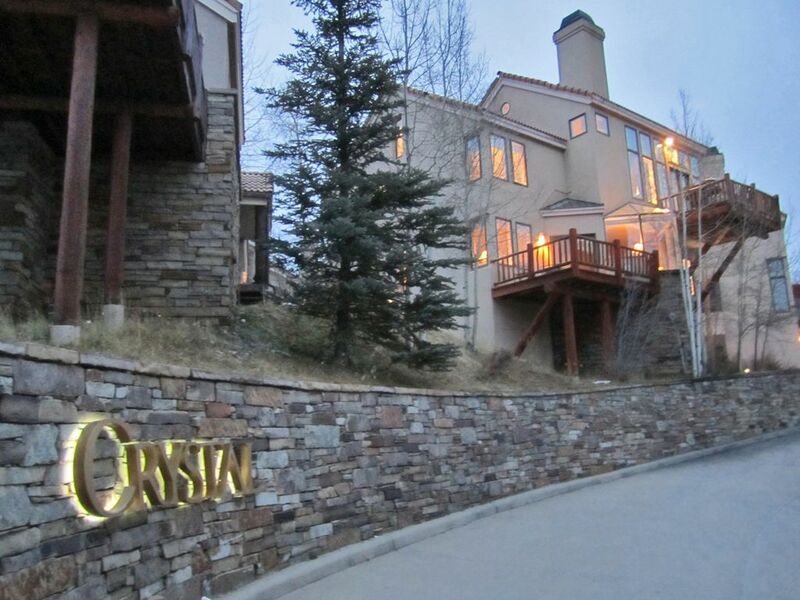 There is no better location for village core amenities and ski-in, ski-out access. Laundry room with two, front-load washers and dryers. Adjacent to the Village core, only 3 min walk to the gondola and less than that to the village restaurants and shops. See the upper ski runs from the floor to ceiling windows of the living area. Ski the lower ski runs directly from your ski-in, ski-out access. Ski to the Peaks on the Peaks' Ski Run. Two steps & you're indoors. The ski valet will do the rest including drying and warming boots over night and have your skis ready for you on the snow. Complimentary Hot Chocolate and Cider all day long. Only 134 steps back to your front door after skiing. 134 steps to the ski valet where your boots and skis are kept warm and ready for you in the morning. Step into your bindings and ski down to the chair lift. Lift tickets may be picked up or purchased at the valet. We provide paid for, ski-in, ski-out access including ski and boot storage at the Peaks Hotel, just a 2 min walk from the door. You never carry your skis. Hot water baseboard heating. It takes 24 hours to heat the home. Separate Laundry room with two washing machines, two clothes dryers and folding table and supplies. (2) Two, Maytag Neptune clothe's dryers. Gas fireplace - flip the switch and it's ON. One private space outside plus additional guest parking. Outside parking only. High speed, secure ethernet and wireless (speeds of T-1 receiving data) is on-premise. Large, open kitchen with Viking gas range and lots of dishes, cooking implements and everything you'll need. 3 balcony's. One has the hot tub. One is in front, perfect for morning coffee (summers) and one off of the living room/dining area with a weber grill. (3) Three decks.. Enjoy the sunshine in the summers on the front deck. Dinners on the living room deck with table, chairs, grill.... and privacy and hot tub on the deck off of the crystal room and master bedroom. (7) Steam shower in the home and if that's not enough, there are 3 saunas, 3 steam rooms, 5 hot tubs (4 indoor, one outdoor) at the Peaks Fitness Center! Additional fee applies. 25 yard indoor lap pool, awesome indoor-outdoor pool, water slide at the Peaks Spa & Fitness Center. As our guests, you get access at 50% off of the normal, guest rate. Private, 7 man hot tub on the private deck. Complimentary Ski & snowboard storage and ski-in, ski-out access Peaks Hotel only steps from your front door. All bathrooms have spa products including shampoos, conditioners, body wash and lotions for high-altitude skin care. Saunas and additional hot tubs, etc are additional fee at the Peaks Hotel for an additional fee. We enjoyed the unit and the responsiveness of the owner was excellent! We traveled with a group of 11 people which included 5 couples. The two “loft” areas slept fine but don’t include the same privacy that comes with a bedroom. Overall we made all of it work and the inclusion of lift ticket passes made this a wonderful place. I would recommend staying here. Full disclosure, the owners gave us as tenants low scores for "house rules," which were not published. Despite the above we will remember that: Telluride skiing is delightful. The kids loved the steep loft. The Peaks ski valet service + medallions are amazing. We were thrilled with the location, despite the many steps. The Peak's ski concierge and ski medallions really improved our skiing experience. Also, it was only a short walk to the gondola, which our non-skiers rode to Telluride for shopping, lunch, and some sledding at Town Park. The house accommodated our large group and was well worth the rental price. Although the sleeper sofa mattresses were comfortable, we wished the open (no doors) dens had more privacy. The kitchen had everything we needed to cook dinner, but we could have used some storage containers for our left-overs. The double washer/dryers were appreciated. Our group would definitely stay at this house again on our next ski trip. The home worked out fine for our group of 2 families but overall it could use some general maintenance to bring it to par with other places we’ve stayed in the area. The home is showing it’s wear as a rental over the years and could benefit from an end of season refresher (new paint throughout, replacement of broken /cracked tiles, stretching and cleaning of carpet, de-cluttering of closets and unnecessary furniture). The hike downhill /uphill to and from the Peaks for ski equipment was more than we expected. If you were staying at the Peaks, I’d call it “ski-in, ski-out” but the hike to and from the house makes it less so. Not an issue for summer renters as the walk to the village center isn’t bad. We really enjoyed the hot tub at the end of each day and the 2 ski medallions were definitely a nice perk! Crystal 14 fit our needs. With 10 people, we needed space. The kitchen was well stocked. The owners responded quickly to our needs during the week. The ski medallions were a great addition to the vacation. The view from the deck is wonderful. I would not label the property ski in, ski out. There is a short walk to the slopes. The ski access is through the Peaks resort. Family time for wedding was relaxing and spacious for our needs. The unit was perfect for our needs and owner was very quick to respond to any and all questions we had. We would definitely go back. Thank you. Fabulous location adjacent to the Mountain Village' pedestrian core.